The new generation of hep C drugs has completely changed the conversation about launches. Back in the olden days of the late 1990s and early 2000s, it took Lipitor – the best-selling prescription drug of all time – four years to get to $5 billion in annual sales, and another four to break $10 billion. But once the product crossed that barrier, it stayed there for seven consecutive years. How times have changed. The biggest name from pharma’s launch class of 2014, Gilead’s hep C drug Harvoni, blew past $10 billion in its first full year on the market, one year after its cousin Sovaldi did the exact same thing. But infectious disease and high cholesterol are two very different beasts, and the Gilead-led launch revolution has been busy eating its own children; few of the recently launched new hep C products, Sovaldi and Harvoni included, seem likely to match their first-year numbers again. Beware, brand managers – in some disease states, you may never get a second chance. Just a year removed from rewriting the record books and more than doubling its total revenue with Sovaldi, Gilead repeated the process with the follow-on Harvoni. Launched in October 2014, Harvoni generated sales of $2.13 billion in the final quarter of 2014 and then a spectacular $13.86 billion during the course of 2015, more than a third better than Sovaldi’s $10.28 billion the year before. Put together, Harvoni and Sovaldi generated $19.14 billion in sales for Gilead last year, by far the most ever for any chemical entity (Harvoni is a combination of Sovaldi with ledipasvir) and well over half the company’s total revenue of $32.64 billion. With such rapid uptake of new treatments, though, room is beginning to run out in the hep C marketplace. In the first half of 2016, Harvoni sales were down 22.3 percent to $5.58 billion and Sovaldi sales rose 16.4 percent, though all of its growth came from Japan and other international markets. In July 2015, Harvoni earned approval from the Japanese Ministry of Health, Labour and Welfare for the treatment of chronic hepatitis C genotype 1 infection in adults. Primarily due to HCV, Japan has one of the highest rates of liver cancer of any industrialized country. Of the more than 1 million people in Japan chronically infected with HCV, 70-80 percent are infected with the genotype 1 strain of the virus. Ex-U.S. and Europe sales of Harvoni totaled $1.6 billion in 2015, mostly due to the product’s launch in Japan. Harvoni’s approval in Japan was supported by data from 318 treatment-naïve and treatment-experienced Japanese patients with genotype 1 HCV infection randomized to ledipasvir/sofosbuvir (n=157) or ledipasvir/sofosbuvir plus ribavirin (n=161) in the Phase III clinical trial GS-US-337-0113. Of the 318 patients enrolled in this study, 34 percent were ages 65 years or older and 23 percent had cirrhosis. Among patients receiving 12 weeks of ledipasvir/sofosbuvir without ribavirin, 100 percent (n=78/78) of treatment-naïve and 100 percent (n=79/79) of treatment-experienced patients achieved sustained virologic response 12 weeks after completing therapy (SVR12). Adverse events observed with ledipasvir/sofosbuvir without ribavirin were generally mild and included nasopharyngitis (29 percent), headache (7 percent) and malaise (6 percent). The approval was also supported by results from three Phase III studies (ION-1, ION-2 and ION-3) evaluating eight, 12 or 24 weeks of ledipasvir/sofosbuvir among genotype 1 HCV patients. Trial participants included patients from the United States, Europe, and Puerto Rico who were treatment-naïve or who had failed previous treatment, including protease inhibitor-based regimens, and also included patients with compensated cirrhosis. Trial participants in the ribavirin-free arms (n=1,080) achieved SVR12 rates of 94 to 99 percent. In November, FDA approved Harvoni for expanded use in patients with genotype 4, 5 and 6 chronic hepatitis C virus (HCV) infection and in patients co-infected with HIV. In addition, Harvoni plus ribavirin (RBV) for 12 weeks was approved as an alternate therapy to 24 weeks of Harvoni for treatment-experienced, genotype 1 patients with cirrhosis. The supplemental new drug application (sNDA) approval for HCV genotypes 4-6 was supported by data from the open-label trials 1119 and ELECTRON-2. Study 1119 evaluated Harvoni for 12 weeks in patients with HCV genotype 4 or 5 who were treatment-naïve and treatment-experienced with or without cirrhosis. Results showed that 93 percent (41/44) of those with genotype 4 and 93 percent (38/41) of those with genotype 5 achieved SVR12. ELECTRON-2 evaluated Harvoni for 12 weeks in treatment-naïve or previously-treated patients with genotype 6 HCV infection with or without cirrhosis. In this study, 96 percent (24/25) of patients achieved SVR12. The sNDA approval for patients with HCV/HIV-1 co-infection was supported by data from the Phase III open-label ION-4 study, which evaluated Harvoni for 12 weeks for the treatment of genotypes 1 or 4 chronic HCV infection among patients co-infected with HIV. Data demonstrate that 96 percent (321/335) of patients achieved SVR12. The study included HCV treatment-naïve (45 percent) and treatment-experienced (55 percent) patients, including patients with compensated cirrhosis (20 percent). The majority of patients were taking one of three HIV antiretroviral (ARV) regimens: tenofovir disoproxil fumarate (TDF) and emtricitabine with efavirenz, raltegravir or rilpivirine. Patients with HCV/HIV co-infection represent approximately 30 percent of the total HIV-infected population in the United States. Compared with HCV infection alone, HIV/HCV co-infection is associated with an increased risk of cirrhosis and the subsequent complications of end-stage liver disease and hepatocellular carcinoma (liver cancer). In February, FDA approved additional indications for Harvoni for use in chronic hepatitis C patients with advanced liver disease. 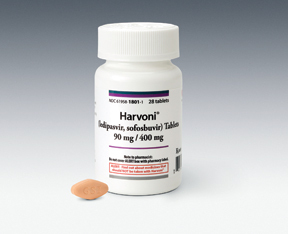 Harvoni in combination with ribavirin (RBV) for 12 weeks was approved for use in chronic hepatitis C virus (HCV) genotype 1- or 4-infected liver transplant recipients without cirrhosis or with compensated cirrhosis (Child-Pugh A), and for HCV genotype 1-infected patients with decompensated cirrhosis (Child-Pugh B or C), including those who have undergone liver transplantation. Harvoni is now approved for use in a broader range of patient populations, including HCV genotypes 1, 4, 5 and 6, HCV/HIV-1 coinfection, HCV genotype 1 and 4 liver transplant recipients, and genotype 1-infected patients with decompensated cirrhosis. The supplemental new drug application approval for genotype 1 or 4 HCV liver transplant recipients without cirrhosis or with compensated cirrhosis, and for genotype 1 HCV patients with decompensated cirrhosis, was supported by data from the Phase II SOLAR-1 and SOLAR-2 trials. These open-label studies evaluated 12 and 24 weeks of treatment with Harvoni in combination with RBV in HCV treatment-naïve and treatment-experienced patients with genotype 1 and 4 infection who had undergone liver transplantation and/or who had decompensated liver disease. TBWA\WorldHealth is Harvoni’s lead agency for HCP communications. We asked the agency’s managing partner, Kristen Gengaro, about the relationship. Med Ad News: Talk about the relationship between TBWA\WorldHealth and Gilead. What made it work so well? What challenges did you face? What lessons have you learned? Kristen Gengaro: Have you ever been fortunate enough to work with a client who really pushed you to be your personal best? Well, Gilead is that client. While their standards for excellence are certainly high, they take seriously the responsibility of motivating and inspiring the agency team to do their very best work. As a senior leader in this organization, I’ve watched the work product of our internal team continue to be elevated, as each team member reaches beyond what they imagined possible. I’m proud of the work we’ve produced from the agency; but more importantly, I’m proud of the relationship that has made this possible. The nature of our work was not without challenges, though. We partnered on three sequential launches in as many years, so the incredible pace of work was sustained, versus tapering over time. In addition, we set out to drive alignment on the work across many stakeholders around the globe, and as any agency leader might attest, the road to alignment – despite the use of proven approaches and tried-and-true tools – always yields important learnings. But we’ve learned that being fearless about the tough conversations, and sharing accountability for continuous improvement, are fundamental to maneuvering through the alignment process together. Med Ad News: It’s easy to point out all the differences between a monster launch such as Harvoni and, say, something aiming for $50-$100 million in annual revenue. But we are more curious about the similarities. What are a couple of key elements that all great launches, big or small, share? Kristen Gengaro: We’ve had the benefit of launching products of all shapes and sizes; and as you note, there are a few constants. First, it’s imperative to have a clear and differentiated story at launch. Our agency uses a process called Disruption to identify category conventions, and set our brands apart by finding open space in a given therapeutic area. All brands, regardless of total market size, are capable of developing and owning a unique space in their respective marketplace. Next, we’ve seen clients with the very best products fall down when it comes to operational excellence. Every day without a quality promotional piece in the hands of your reps could be millions in opportunity costs. As we know, the process to get a given piece to the field requires many things to go according to plan. Multiply that by 25 field pieces, and multiply by several audiences and the many channels beyond your field force, and the probability of executional failures is highly significant. Having a well-architected plan around launch excellence, detailed Day 1 through Day 30 efforts, and a robust dependency planning process, are imperative for launch success. Finally, we know that a launch plan geared toward insight-driven, high-impact initiatives – regardless of budget size – is critical. The trajectory of your first five months in the market can often determine the success or failure of your launch. The clients who invest in the hard work before launch – sharpening their understanding of the customers, pressure-testing their go-to-market plans, right-sizing their investment based on the customer base and brand potential, and adopting a philosophy of “failing fast” in service to refining decisions – invariably see the greatest success out of the gate. This is not about a high level of spend, but instead, smart expenditure of resources, intellectual capital, and effort. Approved in December 2014, AbbVie’s Viekira Pak is an all-oral, interferon-free treatment, with or without ribavirin indicated for the treatment of patients with chronic genotype 1 hepatitis C virus infection, including those with compensated cirrhosis. As of its launch, Viekira Pak was the only FDA-approved regimen containing three distinct mechanisms of action – a NS5A inhibitor, a NS3/4A protease inhibitor, and a non-nucleoside NS5B polymerase inhibitor – that work together to attack the virus at three separate stages of the disease lifecycle to inhibit it from reproducing. In its first full year on the market, Viekira Pak generated $1.64 billion in global sales for AbbVie; sales of the product in the first half of 2016 totaled $833 million. The approval of Viekira Pak was supported by a clinical development program designed to study the safety and efficacy of the regimen in more than 2,300 enrolled patients across 25 countries. The program consisted of six pivotal Phase III studies, which demonstrated that Viekira cured 95-100 percent of GT1a and GT1b hepatitis C patients, including patients new and experienced to treatment, and patients with compensated cirrhosis, with less than 2 percent of patients experiencing virological failure. Additionally, more than 98 percent of patients in clinical trials completed a full course of therapy. Viekira’s approval was also based on the results from Phase II clinical trials, which showed that the compound cured 97 percent of liver transplant recipients and 92 percent of patients co-infected with HCV/HIV-1. In February 2015, published results from the TURQUOISE-I study showed that patients co-infected with genotype 1 hepatitis C virus and HIV-1 receiving Viekira Pak and ribavirin for 12 weeks or 24 weeks achieved sustained virologic response rates 12 weeks post-treatment of 94 percent (n=29/31) and 91 percent (n=29/32), respectively. The SVR12 rates were 91 percent (n=51/56) for subjects with HCV GT1a infection and 100 percent (n=7/7) for those with HCV GT1b infection. 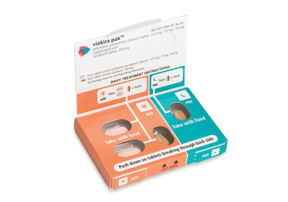 In October, AbbVie updated the label for Viekira Pak from “Not recommended in Child-Pugh B patients” to a contraindication in patients with Child-Pugh B cirrhosis. Patients classified as Child-Pugh C will remain contraindicated as they have been since approval. The updated labeling also includes a recommendation for physicians to assess evidence of hepatic decompensation prior to treatment and during treatment in cirrhotic patients. The labeling was updated following post-marketing reports of hepatic decompensation and hepatic failure, including liver transplantation or fatal outcomes, in patients receiving AbbVie’s HCV treatment, with or without RBV. Most patients with these severe outcomes had evidence of advanced cirrhosis prior to initiating therapy. In November, AbbVie announced new data from its ongoing Phase IIIb TOPAZ-II study evaluating Viekira Pak, with or without ribavirin (RBV), in adult patients with genotype 1a or genotype 1b chronic hepatitis C virus infection. The results showed that 95 percent (n=586/615) of patients in the TOPAZ-II trial achieved a sustained virologic response at 12 weeks post-treatment after 12 or 24 weeks of treatment, a secondary endpoint for the study. The TOPAZ-II study, a multicenter trial in the United States, is evaluating the impact of SVR12 on the progression of liver diseases over the course of five years in a diverse patient population, including genotype 1 HCV patients with or without cirrhosis and those who were treatment-naïve or pegylated interferon (pegIFN)/RBV treatment-experienced. Patients were treated with Viekira Pak, with or without RBV, according to the dosing recommendations found in the U.S. full prescribing information. In April, FDA approved a supplemental new drug application for the use of Viekira Pak without ribavirin in patients with genotype 1b chronic hepatitis C virus infection and compensated cirrhosis (Child-Pugh A). The TURQUOISE-III study included in the sNDA evaluated the use of Viekira Pak without RBV for 12 weeks in GT1b patients with compensated cirrhosis (Child-Pugh A). Results demonstrated 100 percent (N=60/60) sustained virologic response at 12 weeks post-treatment. No patients discontinued treatment due to adverse events. In July, FDA approved a new drug application for Viekira XR, a once-daily, extended-release co-formulation of the active ingredients in Viekira Pak (ombitasvir, paritaprevir, and ritonavir tablets; dasabuvir tablets). The new formulation is approved for the treatment of patients with chronic genotype 1 hepatitis C virus infection, including those with compensated cirrhosis (Child-Pugh A). Viekira XR is the first co-formulated three direct-acting antiviral (DAA) treatment for adult patients with GT1 HCV. The approval was supported by Phase III clinical trials for Viekira Pak which include data that demonstrated 100 percent sustained virologic response 12 weeks following treatment (SVR12) in GT1b patients with 12 weeks of therapy without ribavirin and 95 percent SVR12 in GT1a patients when used with ribavirin for 12 or 24 weeks of therapy. Bristol-Myers Squibb’s oncology biologic Opdivo earned its first FDA approval in December 2014, for treating patients with unresectable or metastatic melanoma and disease progression following Yervoy (ipilimumab) and, if BRAF V600 mutation positive, a BRAF inhibitor. During its first full year on the market in 2015, the new compound earned Bristol-Myers Squibb $942 million in sales; in first-half 2016, Opdivo handily surpassed that with $1.54 billion. One of the reasons for Opdivo’s impressive growth is the additional FDA approvals it received in the past 18 months. In March, the U.S. regulatory agency approved the drug for the treatment of patients with metastatic squamous non-small cell lung cancer (NSCLC) with progression on or after platinum-based chemotherapy. Opdivo is the first PD-1 (programmed death receptor-1) therapy to demonstrate overall survival in previously treated metastatic squamous NSCLC. Then, in October, FDA approved Opdivo in combination with Yervoy for the treatment of patients with BRAF V600 wild-type unresectable or metastatic melanoma. 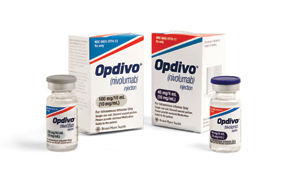 And that same month, FDA also approved Opdivo injection, for intravenous use, for the treatment of patients with metastatic non-small cell lung cancer with progression on or after platinum-based chemotherapy. Just a few weeks later, Opdivo received the Prix Galien USA 2015 Award for Best Biotechnology Product, making BMS the first company ever to win the award for two immuno-oncology agents; Yervoy won in 2012. In November, FDA approved Opdivo injection, for intravenous use, for treating patients with advanced renal cell carcinoma who have received prior anti-angiogenic therapy. The approval made Opdivo the first PD-1 inhibitor to deliver significant overall survival in patients with advanced RCC who have received prior anti-angiogenic therapy. That same month, FDA also approved Opdivo injection, for intravenous use, as a single agent for the treatment of patients with BRAF V600 wild-type unresectable or metastatic melanoma. The additional approvals have continued into 2016. In January, FDA approved Opdivo in combination with Yervoy for the treatment of patients with BRAF V600 wild-type and BRAF V600 mutation-positive unresectable or metastatic melanoma. At the same time, the agency also expanded the use of Opdivo as a single agent to include previously untreated BRAF mutation-positive advanced melanoma patients. Then, in May, FDA approved Opdivo for the treatment of patients with classical Hodgkin lymphoma (cHL) who have relapsed or progressed after autologous hematopoietic stem cell transplantation (auto-HSCT) and post-transplantation brentuximab vedotin. The monoclonal antibody remains in development for other oncology indications, including squamous cell carcinoma of the head and neck, urothelial carcinoma, and colorectal cancer. Opdivo was initially developed by Ono Pharmaceutical and Medarex, which was acquired by Bristol-Myers Squibb during 2009. Ono holds development and marketing rights to the drug in Japan, Korea and Taiwan.